Like Julien mentioned in the last blog entry, to understand what is happening evolutionarily with the marmots, we need to know their pedigree. To do this, we need to genotype all the new pups every summer to see who their mom and dad are. This is where I come in- I am in charge of doing all the lab work and analysis that will allow us to assign pups to their parents. To start everything, we need a sample of DNA. When we are out in the field, we collect hair from every new individual we trap (this means all the newly emerged pups). We store these samples in a freezer till we can get back to UCLA and get in the lab. 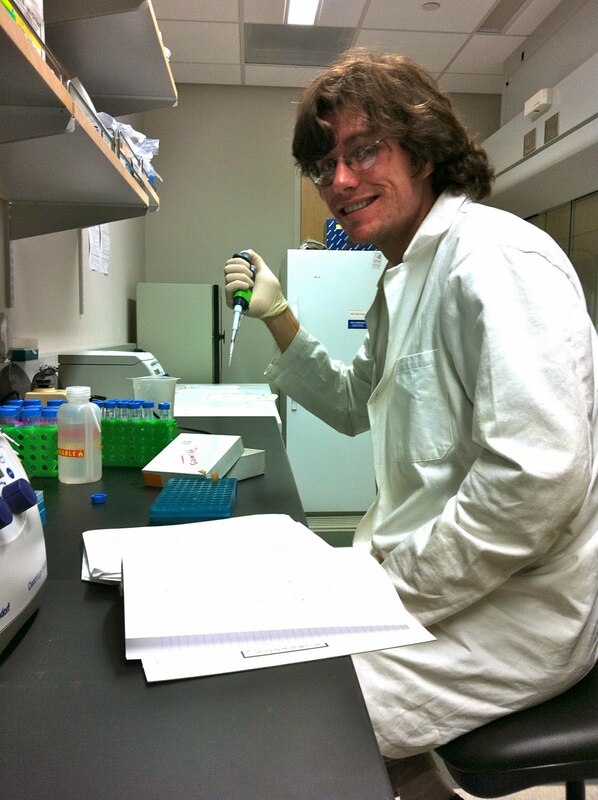 Once back in Los Angeles, I take a bunch of hairs and stick them in a tube with a solution that lyses the cells and allows me to extract the DNA. Everything should be good now, right? I have my DNA and I should just be able to go get it genotyped, but hold on…there are a couple other steps involved before we get a pedigree. The machine that tells us the genotype needs many, many strands of DNA to be able to read it, so we need to amplify it. We do this using PCR, or Polymerase Chain Reaction. We place our marmot DNA in a tube with nucleotides, primers, and DNA Polymerase and heat and cool the mixture several times. The heating and cooling make the DNA denature, or come apart, and come back together. At the end of the process, we have thousands of strands of DNA where we only had our original strands of marmot DNA. We send this PCR product off to get genotyped. It takes about a day, and before you know it we get back a file that tells us the genotype of our marmot pups. The next step is going through all these genotypes and comparing them with potential mothers and fathers. To do this, we look at 12 microsatellites that are highly variable. What this means is that we look at 12 “sites” on their DNA and see what the allele is. We can then look at the potential parents and see what their alleles are at these corresponding sites. If they match, we can be pretty confident that we have found the right parent. Sometimes though, we can’t always be sure about the parents using molecular methods; that’s when we include our social observations to determine parental assignment. Once this is done, we can start looking how different traits(morphological or behavioral) are changing over generations and we can make inferences about how marmots are evolving. 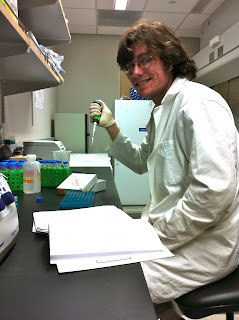 Here I am with pipette in hand, trying not to mess up the samples.